Papa Bert’s Sippin Seat Revew-Can you sip discreetly? Does Papa Bert’s Sippin Seat Really Work? It will soon be time where we will be sitting in the bleachers watching our budding little sports stars play their favorite sports games. Just think of that hot sun beating down on you and would a nice drink quench your thirst right now? Well you could actually be sitting on your thirst quencher with the Papa Bert’s Sippin seat. It really is true, one innovative person dubbed as Papa Bert has designed a cushion that can be filled with a liquid that possesses a long straw that you can bring up to your lips and take some long hard sips to quench your thirst. Now how convenient is that or then how practical is that? While we introduced this Papa Bert’s sippin seat as a drink carrier to take to the amateur sports setting the promoter’s of this product are touting its use for stadium use. You know those places where you go to watch the big events and it costs you a fortune to purchase a thirst quencher whether it be alcoholic or non alcoholic. For those of you who like your beer or wine, the marketer’s state that this cushion will hold 2.1 bottles of beer or a bottle of wine. That should be enough to get you through most of the game. They hype really focuses around sneaky drinking. It serves as a way to bring in your cold or hot drink where it is usually prohibited to bring in your refreshments to a venue. Who would think that the cushion you are carrying is loaded with your own drink? The promo material addresses all the concerns you may have with an item such as this, as being able to properly clean it for safety and sanitary reasons. You are looking at a cost of about $30. for this item with a selection of colors. First you are going to have to be brave enough to carry this item with you to your chosen even. Don’t forget it is really being promoted for sneaky drinking. Now, no doubt those sitting close to you are going to give you a second look when they see that long plastic straw coming from your seat up to your mouth. So you are going to have to be committed to not minding becoming a small center of attention. On a more serious note though you are going to have to be diligent about cleaning the product properly after use. Of course you also want to adhere to responsible drinking practices when using this item for alcoholic beverages. Every once in a while it is nice to lighten up and have something fun to make use of. This is what we consider the Papa Bert’s Sippin Seat to be. Yet, it really does have a practical use to it when you really think about it. Even if you don’t use it for yourself it is a great item for the kids. We are going to give the Sippin Seat a Thumbs/Up rating. Based on the premise that it is a fun yet practical item that is not too expensive and can actually save you some money and aggravation, it makes sense to give it this rating. We are all for products that make life easier, just like we said with the Soft Super Cooler when we reviewed it. Of course there are lots of other methods for storing and carrying drinks on the go, or to a venue where you don’t want to buy your drink. Flasks are one way, but they are pretty obvious if you drink straight from them, and can be a little awkward if you are trying to be discreet when pouring the liquid from them into a glass. 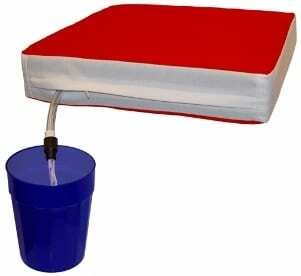 So we think this Papa Bert’s Sippin Seat is an ideal solution for drinks on the go. What do you think? Does Papa Bert’s Sippin Seat work or not?